I love pizza. Thin crust, thick crust, deep dish, whatever. I love it all. This is my second attempt at pizza dough (the first time I made this yummy recipe) and I’m still amazed at how easy it is. Although this recipe looks daunting with the multiple steps, don’t be scared! It’s fairly simple to make, worth the time, and yields a thin crust with a nice crunch is spots. Top it with whatever you want (I used homegrown green peppers from my balcony garden, among other things), and enjoy your delicious pizza! I used a mixer (first the paddle attachment then the dough hook) and froze all of the dough balls so that I can pull them out and put them in the fridge the night before I want to make pizza. Talk about convenient! I don’t have a pizza stone so I used a regular cookie sheet and baked the pizza at 450F for 7-8 minutes. I had trouble tossing the dough so I rolled it out with a rolling pin. Using an electric mixer fitted with the paddle attachment, stir together the flour, salt, and instant yeast in a 4-quart bowl. On low speed, stir in the oil and the cold water until the flour is all absorbed. Switch to the dough hook and mix on medium speed for 5 to 7 minutes, or as long as it takes to create a smooth, sticky dough. The dough should clear the sides of the bowl but stick to the bottom of the bowl. If the dough is too wet and doesn’t come off the sides of the bowl, sprinkle in some more flour just until it clears the sides. If it clears the bottom of the bowl, dribble in a teaspoon or two of cold water. The finished dough will be springy, elastic, and sticky, not just tacky, and register 50 to 55F. Sprinkle flour on the counter and transfer the dough to the counter. Prepare a sheet pan by lining it with baking parchment and misting the parchment with spray oil (or lightly oil the parchment). Using a metal dough scraper, cut the dough into 6 equal pieces (or larger if you are comfortable shaping large pizzas), You can dip the scraper into the water between cuts to keep the dough from sticking to it. Sprinkle flour over the dough. Make sure your hands are dry and then flour them. Lift each piece and gently round it into a ball. If the dough sticks to your hands, dip your hands into the flour again. Transfer the dough balls to the sheet pan. Mist the dough generously with spray oil and slip the pan into a food-grade plastic bag. On the day you plan to make the pizza, remove the desired number of dough balls from the refrigerator two hours before making the pizza. Dust the counter with flour, and then mist the counter with spray oil. Place the dough balls on top of the floured counter and sprinkle them with flour; dust your hands with flour. Gently press the dough into flat disks about 1/2 inch thick and 5 inches in diameter. Sprinkle the dough with flour, mist it again with spray oil, and cover the dough loosely with plastic wrap or a food-grade plastic bag. Let rest for 2 hours. At least 45 minutes before making the pizza, place a baking stone either on the floor of the oven (for gas ovens), or on a rack in the lower third of the oven. Preheat the oven as hot as possible, up to 800F (most home ovens will go only to 500 to 550F, but some will go higher). If you do not have a baking stone, you can use the back of a sheet pan, but do not preheat the pan. Generously dust a peel or the back of a sheet pan with semolina flour or cornmeal. Make the pizzas one at a time. Dip your hands, including the backs of your hands and knuckles, in flour and lift I piece of dough by getting under it with a pastry scraper. Very gently lay the dough across your fists and carefully stretch it by bouncing the dough in a circular motion on your hands, carefully giving it a little stretch with each bounce. If it begins to stick to your hands, lay it down on the floured counter and reflour your hands, then continue shaping it. Once the dough has expanded outward, move to a full toss. If you have trouble tossing the dough, or if the dough keeps springing back, let it rest for 5 to 20 minutes so the gluten can relax, and try again. You can also resort to using a rolling pin, though this isn’t as effective as the toss method. When the dough is stretched out to your satisfaction (about 9 to 12 inches in diameter for a 6-ounce piece of dough), lay it on the peel or pan, making sure there is enough semolina flour or cornmeal to allow it to slide. Lightly top it with sauce and then with your other toppings, remembering that the best pizzas are topped with a less-is-more philosophy. The American “kitchen sink” approach is counterproductive, as it makes the crust more difficult to bake. 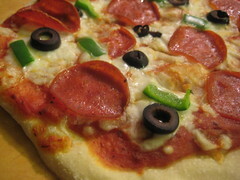 A few, usually no more than 3 or 4 toppings, including sauce and cheese is sufficient. Adapted from The Bread Baker’s Apprentice via Perry’s Plate. Also, just a reminder that Nosh is participating in the Donor’s Choose social media challenge. Please donate!